The above two tree ornaments come to you courtesy of The Boy. He designed and made them on Friday, and I just had to include them in the ornament series! I'm big-time in love with them. They're so simple, beautiful, innocent. It's the kid thing. Those little fingers do magic, I tell you. He made them from a cereal box, paint, pistachio nutshells, junkmail confetti, string, scissors and glue. The pistachio shells, I'd painted a while back, so when it came time to decorate his trees, the shells were there for the taking. In fact, if you plan to do a collage craft like this with your kids, it's a very good idea to prepare all the decorative bits ahead of time. That way, there's no waiting and they can dig right in! The shells need a generous amount of glue if they are to stay put. 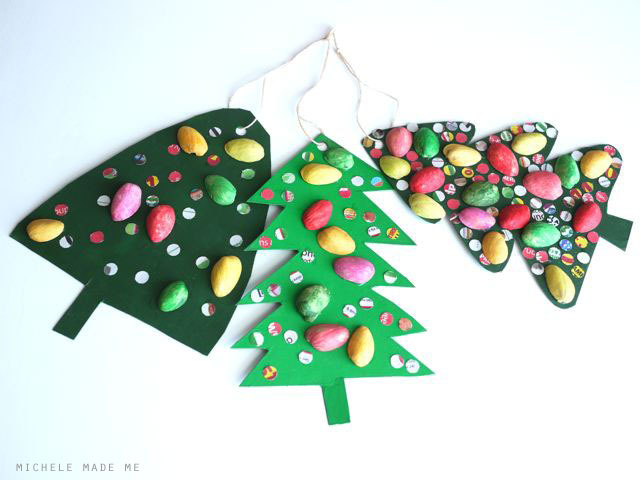 He applied a goodly blob to each before attaching them to the trees. Those little guys are there for the duration, methinks. The confetti was punched from Christmas-flavoured junkmail, a favourite in these parts. But who am I kidding? There was no way I was going to let him have all the fun. Nuh-huh, I just could not do it. I had to make one of my own too, right? Here's mine below. I'm thinking of asking The Boy to make me a whole grove of them. Wouldn't that be great? I wonder if he'd go for it... Do you think? Previous installments in this little ornament series: here, here and here. perhaps he'll make another 2 but then... come on something new? These are so wonderful! Painted pistachio shells, I would never have thought of that!! 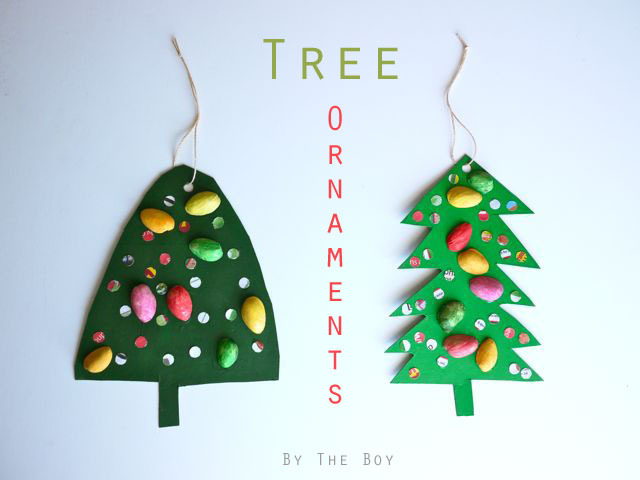 You post the msot fun family ornament projects ever! I think it might be worth asking him...they came out gorgeous. Very cute! I'll be linking to it soon! Oh, they are so awesome. The boy has some great ideas---following in your footsteps, Michele! I love the treesome! Yes, make a whole garland of them. The nut shells are such a great detail! Ehose look good enough to eat! oops sorry...THOSE look good enough to eat. 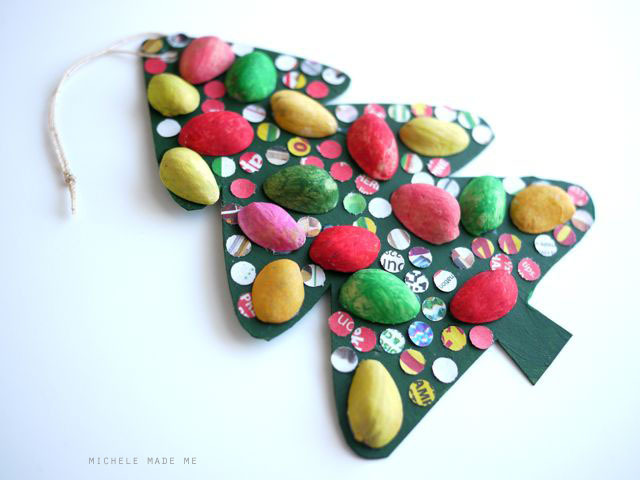 And I love the Christmas junk mail confetti dots too.